"The evidence is clear!" the prosecutor declared. "This woman would not float in the pond when bound hand to foot. People she did not like have suffered crop failure. Strange marks grow on her body that will not bleed when cut. By all scientific and legal measures, the jury must surely realize she is guilty. She is a witch!" We - some seventy-five visitors to Colonial Williamsburg - comprised the jury. I sat on the wooden bench with my mom, my daughter Laina, then 13, and her friend Nancy. Under the flickering light of the Capitol Building candle chandeliers, where men like Thomas Jefferson, Thomas Paine and George Washington began their political careers, we'd become part of "Cry Witch," a performance created from actual, early-1700's newspaper reports of a witchcraft trial. Our verdict? Not guilty. Different from the original decision. "They didn't prove that she actually did anything, and there's really no such thing as a witch," the girls said afterward. "But, this was supposed to be the eighteenth century," I argued. "Sounds like you were modern jurors." 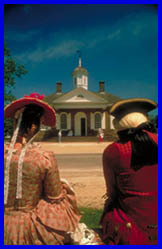 Colonial Williamsburg re-creates the carefully planned city that stood as Virginia's capitol from 1699 to 1780. Located midway between Richmond and Norfolk, it's the centerpiece of a region filled with historic places such as Yorktown, site of the Revolutionary War surrender, Jamestown, America's first permanent English settlement, and four classic southern plantations. Thoroughly contemporary attractions are here, too, like Busch Gardens and the Water Country USA water park. While Colonial Williamsburg concedes to certain modern needs (like air-conditioning in selected buildings), time has pretty well stopped here in 1774. At the eastern end of Duke of Glouceter Street, the main drag, stands the sturdy Capitol Building, designed with rounded, turret-like towers on each side. To the west, Bruton Parish Church. Between, the street is lined with clapboard houses, taverns and small businesses, and at its center stands Market Square, a grassy field with several canvas souvenir stalls, the public stocks and The Magazine, a six-sided, ammunition storehouse. A long, tree-lined mall leads north to the grand Governor's Palace. A working farm, brickyard and other residences are set in outlying sections of town. The restored buildings are impressive. But, it was the people we met - real citizens realistically portrayed by excellent actors - who captured our imaginations and brought the era to life. "You've got quite the luck," the harness and saddlemaker advised the girls as we entered his little shop, "we're just now working on a lady's saddle." He affably described the many processes required to produce a finished saddle but, charming as he was, he couldn't coax Laina or Nancy to climb up and try one on for size. In the dry goods store, proprietor John Greenhow held forth about "the way those rascals in Boston Towne are behaving, dressing up like Indians and causing mischief." And who was that delivering a speech under a tree behind the Palace? Thomas Jefferson - in person. At the Powell Farm House, Mrs. Powell instructed the girls in proper table etiquette. "When we serve poultry, we always leave the head and feet on the animal," she explained. "People want to know what they're eating." A group of slaves, who comprised more than half of colonial Virginia's population, enthralled (and sobered) us with stories, songs and proverbs from Africa. Indentured servants demonstrated the skills - like brick-making, cobbling and carpentry - that would, after seven years, enable them to earn a living as freemen. Returning to yesteryear, we strolled house-to-house on an evening, lantern-lit, walking tour called "Legends of the Past". We heard fascinating stories told by a sailor, a merchant's wife, and a farmer, each offering a glimpse into the colonial world, and into the teller's unique view of it. Next day, we explored the archeological sites at Carter's Grove and Jamestown. But, still, so much remained to see and do. The good news is Williamsburg "Patriot Pass" tickets are valid for a year. Investigating the area thoroughly could very well take a full year. Colonial Williamsburg. 134 North Henry Street, Williamsburg, VA 23185; (800) 447-8079 or (757) 229-1000; www.colonialwilliamsburg.org. 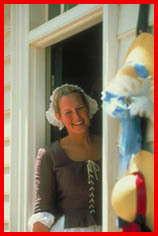 Williamsburg's Revolutionary Fun Package; (800-211-7169). Offers families package rates on multi-day visits, with admission to Colonial Williamsburg, Jamestown Settlement, Yorktown Victory Center Busch Gardens and Water Country USA. Busch Gardens Williamsburg/Water Country USA. 1 Busch Gardens Boulevard, Williamsburg, VA 23185; (757) 253-3350; www.buschgardens.com. Busch Gardens: open March - October with variable hours. Water Country USA: open early May - mid-September with variable hours. A variety of multiple-day and multiple attractions tickets also available, including combination admission with Colonial Williamsburg. LODGING We recommend staying within Colonial Williamsburg's site. Williamsburg Woodlands. PO Box 1776, Williamsburg, VA 23185; 800-447-8079. In a true park-like setting, with miniature golf, tennis courts, table tennis, horseshoe pit, badminton and shuffleboard courts, fitness course, two pools and a wading pool. Children ages 5-12 can, for a fee, participate in the Young Colonials' Club, both daytime (lunch and kids-only visits to the Historic Area) and evening (dinner and entertainment, music, magic and games), during summer months. Various package and multi-day plans available. Williamsburg Inn. Francis Street, Williamsburg, VA 23185; 800-447-8079. A luxury property with fitness center, indoor pool, outdoor tennis courts, croquet and lawn bowling greens, outdoor swimming pools, ponds and nature walks. Afternoon tea served daily. Children are welcome at the Young Colonials' Club. Various package and multi-day plans available.